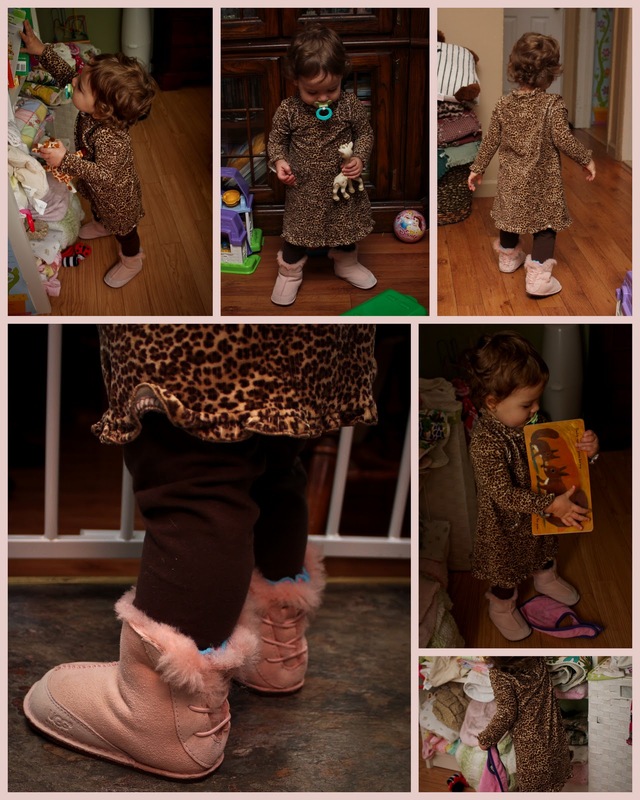 This is something I was looking forward to for a long time ...Putting Julianna's little Pink Uggs on her! I got them for my baby shower almost 2 years ago! She wasn't even born yet when I got her little pink Uggs! I knew she would not be able to wear them until this winter; so I put them on her the other day, and they fit perfect. A teeny bit big but she should be able to wear them all winter long.I know it's silly but I could not wait for her to wear these! hehe! She loves them - she was a little wobbly at first, but then she was off to the races! Runnnning! Love the Uggs!!! I would love for Kylie to have a pair, but not sure if I'll get her any yet or not, it really doesn't get that cold here, BUT I'll get her some eventually. I also like ugg tularosa shoes very much,fashion style in winter. I love babies in a cute pair of boots!! Those are super cute!! !